Stunning Volatility is the new “fact of life” that defines our age. Financial markets fall off cliffs one day, but then stage a recovery the next, only to do it all over again. The switch back and forth is emotionally draining, making us susceptible to the rational responses that can turn manageable problems into huge personal crisis. But while there is danger in volatility, there is also the opportunity to profitably juggle the knives that volatility throws your way – with less risk than you might think. Jubak analyzes these and other trends, providing practical insights and specific investing strategies which show investors how to respect – but not be scared of – market volatility, and how to make smarter investment decisions to profit from and hedge against volatility. 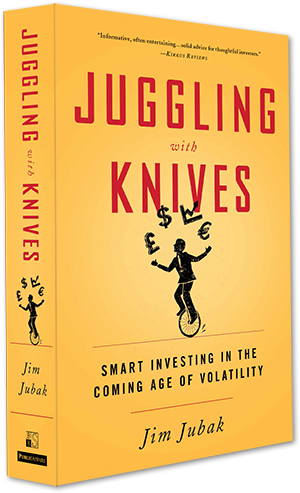 “Investment guru Jim Jubak analyzes the growing volatility of both the financial markets and every day life…and offer strategies for profiting in a topsy-turvy world. In this informative, often entertaining book, he details the many ways in which frequent zigzags since 2000 in the financial markets – especially abrupt changes of acceleration and direction – have combined with events in the housing, job, and retirement markets to increase our expectations about the degree of volatility in every day life…. Drawing on his experiences of the last 20 years in the financial market, the research of behavioral economists and neuroscientists, and projections for the immediate future, Jubak describes ways to better understand the scope and direction of rapid changes in key areas and ways to “limit the downside damage and increase the upside potential from this volatility in our portfolios and our lives.” … Whether discussing the effects of food and water shortages or the boom-and-bust real estate markets in such diverse enclaves as hipster Williamsburg (Brooklyn) and Boomer Sarasota (Florida), Jubak brightly illuminates the trends shaping our present era. The current age is one of financial volatility—and the rate at which markets are bottoming out and then rebounding is well above the norm, says market analyst Jubak. In fact, there have been four major volatility crises in 10 years: the Asian currency crisis of 1997, the Russian crisis of 1998, the dotcom bust of 2000, and the global financial crisis of 2007–2008. Jubak feels that our understanding of how this phenomenon works is still woefully inadequate. To determine how investors can survive volatility and even make it profitable, the book’s first half covers the trends that brought about the current situation and all the reasons why we can expect the same for at least the next decade, touching upon the psychology of volatility and how people cope with it (in a word, poorly). The second half covers investing opportunities created by volatility and ways to improve traditional investment strategies, with the overall goal of avoiding panic. This fascinating study doesn’t shy away from the complexity of our current economy, but it’s written with the layperson in mind, resulting in an indispensable guide for anyone looking to navigate the storms with an intact portfolio. 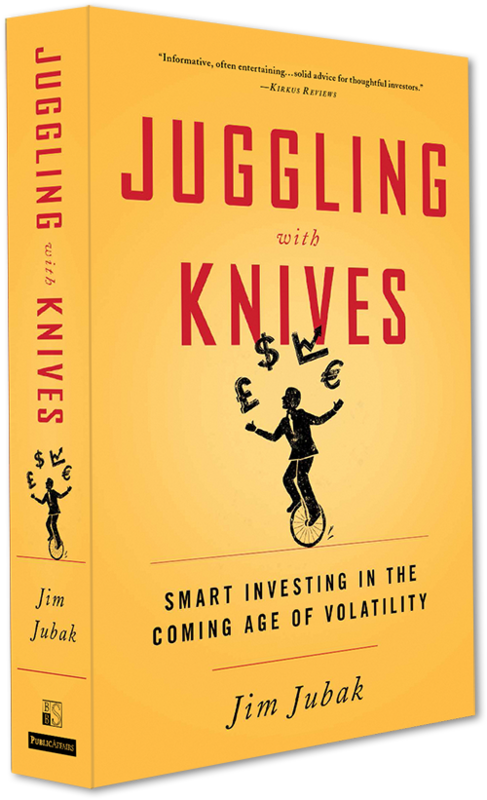 Jim Jubak’s Juggling with Knives (I couldn’t resist the alliteration): Smart Investing in the Coming Age of Volatility (PublicAffairs, 2016) is a thoroughly enjoyable if somewhat unnerving book. It takes us on a roller coaster ride of volatility in the markets as well as in everyday life. And it offers some investing recommendations, which Jubak optimistically prefers to call solutions. Volatility runs in cycles. After a period of very low volatility (from roughly 1981 to 1997) and a transitional phase (1998-2007), we are now in a period of very high volatility, a period that started in 2008. This new era, he contends, is “something more, something different from these historical cycles.” The new spike in volatility isn’t confined to financial markets. Real-world trends such as aging populations and environmental costs are combining with the flood of cheap money from the world’s central banks to produce real-life volatility. Jubak does a masterful job of describing global volatility trends, their causes and dangers, paying special attention to China. But he also brings volatility home, dealing with real estate prices, educational costs, and the job market. Although most of this book is about long-term volatility trends, Jubak notes that they “are accompanied by big surges in instances of short-term volatility. Because long-term volatility produces change that operates in fits and starts as it moves toward a new equilibrium, accelerated long-term volatility results in an increased frequency of bouts of short-term volatility.” (p. 296) Investors and traders should use asset classes that “match the duration of the volatility trends that [they’re] trying to profit from or hedge against”: stocks and bonds for long-term volatility trends, options for short-term volatility events. What are some long-term volatility strategies? For the most part Jubak suggests dividend-paying stocks over bonds, although he points the reader toward some short-term bond plays. He identifies stocks that have strong long-term trends at their backs. These, he says, are the stocks you want to buy low and sell high, over and over again. “Volatility here is your friend—or at least that’s the goal.” (p. 287) He also describes an investing strategy using a basket of emerging market stocks. If you understand the sources of volatility, Jubak concludes, you might “feel less out of control and less a victim of cosmic forces beyond your ken and more like a captain who, because of an ability to read the waves, knows how to steer a ship safely through dangerous storms.” (p. 314) Perhaps yes, perhaps no, but Jubak’s book is a worthwhile read in either case.